5 Seconds of Summer, otherwise known as 5SOS (pronounced five-sauce) began as a group of boys posting covers to songs on YouTube, but has now risen up music charts around the world. Formed in 2011 in Sydney, the Australian pop-rock/“punk rock” band has come out of nowhere, winning 7 of the 23 awards they were nominated for and performing at two major awards shows. The band’s Twitter account has reached 4.66 million followers and is already starting their ninth tour, “Rock Out With Your Socks Out” on May 4, 2015. The group consists of four members: lead vocalist and guitarist Luke Hemmings, bassist Calum Hood, drummer Ashton Irwin, and other guitarist Michael Clifford. But what seems to be catching people’s eyes more than the band, is their fandom. You may have seen members of this fandom on Twitter, Facebook, Instagram feeds, posting photos and statuses filled with exclamation points and heart emojis. 5 Seconds of Summer didn’t know it yet, but its fan-base was about to grow from a few hundred people to a few million people. This is all because of the well-known boy band, One Direction. 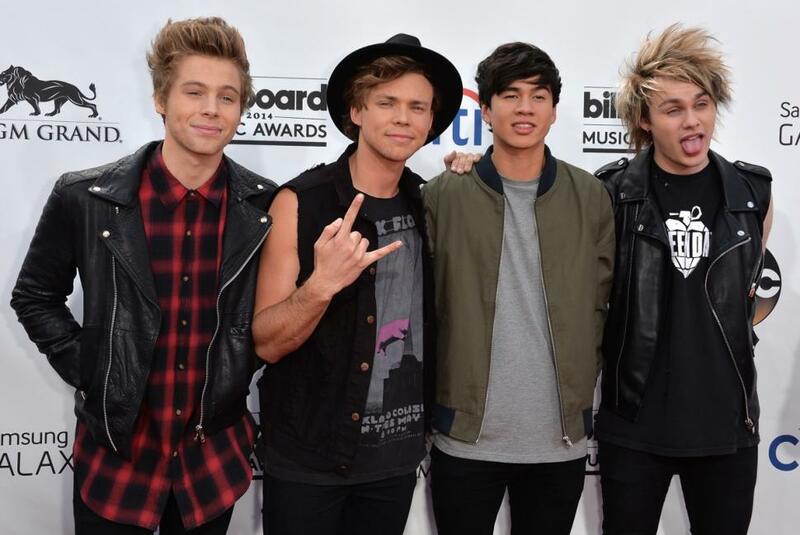 The boys of One Direction discovered 5SOS’ YouTube covers and instantly fell in love with them. Once Janielle found out about this, she wanted everyone to know that she listened to them “BEFORE it was mainstream.” One Direction invited 5SOS to join them in 2013 for their “Take Me Home” Tour. 5SOS was ecstatic and accepted the invitation. The two bands formed an unbreakable bond and 5SOS ended up joining One Direction on their 2014 “Where We Are” Tour. There are lots of people like Gabi who aren’t willing to call 5SOS the best band ever, but they have a liking for 5SOS’ music. The mixture of fans, haters, and semi-fans make 5SOS the band that they are now. A controversial 5SOS topic is whether or not 5SOS is a “boy band.” According to the majority of the 5SOS family, 5SOS is no where near being a boy band. Yes, they are a band consisting of only boys, but there is more to the definition of a boy band. Boy bands are thought to be bands in which boys just sing music and don’t play instruments. All the members of 5SOS play their own instruments and they compose all of their music. They do write songs with other singers and music-related professionals such as Alex Gaskarth from All Time Low and John Feldmann. Hopefully by now you know exactly who 5SOS is. No, I’m not talking about 5 sauces; I’m talking about 5 Seconds of Summer. If you’re already a 5SOS fan, I hope you enjoyed “fan-girling” about this article. Before you turn the page I have one last question: Are you ready for the 5SOS revolution?